Iran is a nation composed of multiple ethnic groups and religions. Islam is by far the most important religion — something in the order of 98% of the population claim to be Muslims — and Shia Islam is the most important branch. The peoples of Iran include Persians, Azeris, Kurds, Lurs, Arabs, Baluchi, Turkmens, Armenians, Assyrians, Jews, and the Qashqai amongst others. Many of these groups now live in urban centers, but many are still rural-based agriculturalists while some remain nomadic herders. 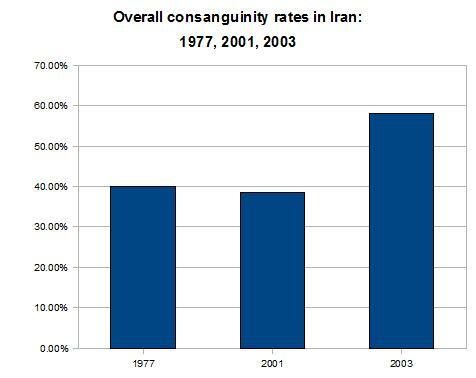 It appears, therefore, that the overall consanguinity rates in Iran have been increasing since at least the 1940s or since the generation(s) that were married before 1948 as defined by Akrami, et. al. Given. B, P., and Hirschman, C. (1994) Modernization and consanguineous marriage in Iran. Journal of Marriage and Family, 56, 820-834. Saadat, M., Ansari-Lari, M. and Farhud, D.D. (2004) Consanguineous marriage in Iran. Annals of Human Biology 31, 263-269. Saadat, M and Mohabbatkar, H. (2003) Inbreeding and its Relevance to Early and Pre-reproductive Mortality Rates in Iran, an Ecological Study. Iranian J Publ Health, Vol. 32, No. 2, pp.9-11. Behanm, D., & Amani, M. (1974). La Population de L’Iran. Paris: CICRED. 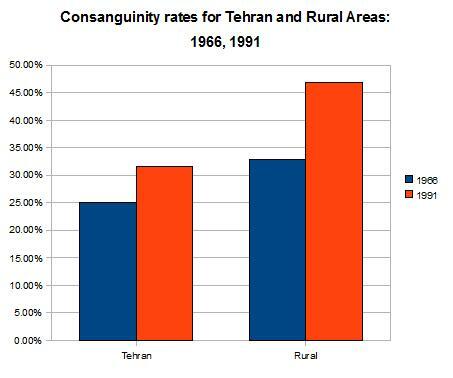 Farhud, D.D., Mahmoudi, M., Kamali, M.S., Marzban, M., Andonian, L., and Saffart, R. (1991) Consanguinity in Iran. Iranian Journal of Public Health 20, 1-13. Akrami, S.M. ; Montazeri, V.; Shomali, S.R. ; Heshmat, R.; and Larijani, B. 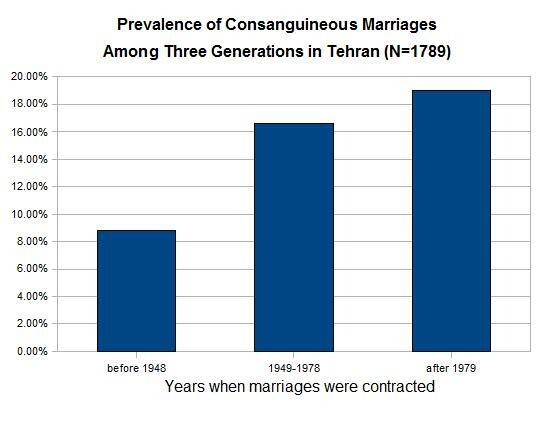 (2009) Is There a Significant Trend in Prevalence of Consanguineous Marriage in Tehran? A Review of Three Generations. J Genet Counsel 18:82–86.